The University of Birmingham has been challenging and developing great minds for more than a century. Characterised by a tradition of innovation, research at the University has broken new ground, pushed forward the boundaries of knowledge and made an impact on people’s lives. 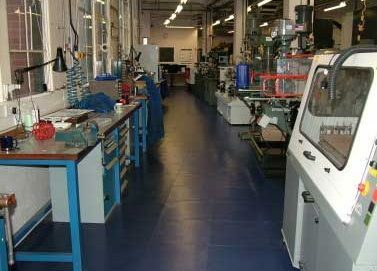 With this in mind Ecotile was the natural choice when the University needed to replace the flooring in the workshop at the School of Physics and Astronomy in Edgbaston. 1. The existing flooring consisted of hardwood blocks 75mm deep laid onto the concrete floor. This was put down c1955. Some sections were removed in 2002 and concrete screed laid, however the majority of the wooden blocks were still in place. When the workshop was refurbished back in 2008 an interlocking tile not manufactured by Ecotile was chosen and within a few years it began to distort and come apart. Only Ecotile’s full complement of quality accreditations persuaded the University to use an interlocking tile again. 2. The floor needed to be tough enough to withstand the usual stresses of a workshop such as heavy machinery, vibration, oils and chemicals as well as wheeled traffic with high point loadings. 3. In such a busy environment it was essential that the tiles should be very low maintenance and easy to clean. “Our interlocking floor tiles are ideal for flooring projects within heavy duty workshops as they offer some important benefits in this tough environment. We were able to deliver a flooring solution that is truly robust, from the day that it is laid and for many years to come which was a crucial consideration for the University who have to invest their money wisely. Furthermore, our interlocking tiles virtually eliminate the direct costs and downtime associated with cyclical maintenance and repainting.